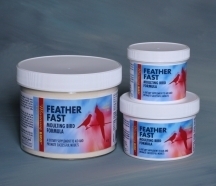 FEATHER FAST is a dietary supplement of high potency vitamins, minerals, amino acids and concentrated protein designed to aid and promote successful molts in all birds. FEATHER FAST provides a broad spectrum of nutrients necessary to produce vibrant, brightly colored, healthy feathers in all birds. Enclosed scoop holds one level teaspoon. One pinch per bird per day during the molt, OR one level teaspoon per day on fruit, vegetables, soaked seed or softfood for 20 pair of finches, 10 pair or cockatiels, or 6 pair of greys. FEATHER FAST works best in combination with Morning Bird’s CALCIUM PLUS. When using Feather Fast, discontinue using any other vitamin-containing supplement. 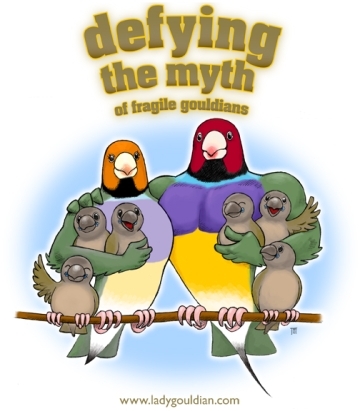 Feather Fast does not contain any Iodine, so you will need to add the Liquid Iodine to the drinking water daily or Dr Marshall's Ioford to the drinking water twice a week to supply your birds with Iodine.